It could have been one of the great games putting two football legends against each other in a city with good reason to hate both teams. Instead the pigskin world was treated to the greatest of all time (seriously, don’t even argue on this point) against a prefabricated opponent seeking to ascend to third team status (behind thevDodgers and Lakers) in the country’s second largest media market. Oh I’m sure the Rams fans are devastated last night, all 63 of them. As a proud part of the Who Dat Nation, I skipped the game, at least most of it. The plan was to watch Atlanta resident and soul music legend Gladys Knight belt out the National Anthem and then walk out to see a movie. Knight was due that much as she was doing so in the face of sniping from Colin Kaepernick’s lawyer and the provocateur quarterback’s vapid twitter mob who likely had to Google and Wikipedia to learn who they were told to shout their hate questioning her integrity and authenticity on the interwebs. Instead of watching the game I went to a hockey game in DC, boycotting the Super Bowl in “All Caps” as the home team took on the Boston Bruins. Many of the Boston fans mixed their sports apparel sporting Patriot caps and Bruin hockey jerseys. One Bruin fan said he was going to drive straight to Atlanta after the game. I filled the rest of the day going to museums and being one of five people in the movie theater seeing Aquaman. 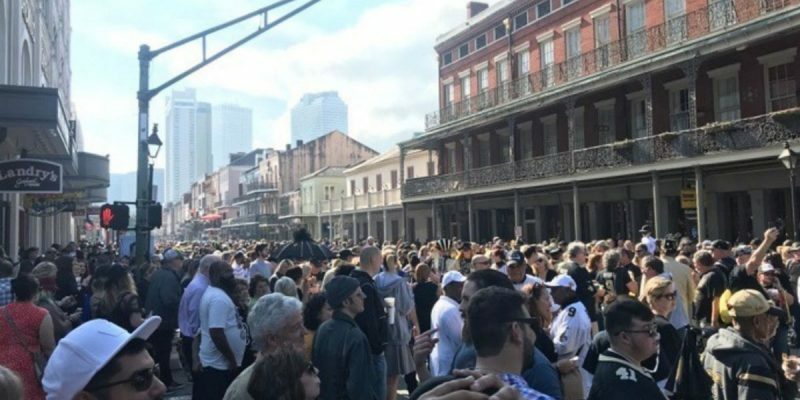 Back in New Orleans, Saints fans filled the streets with a protest march and concerts held to help keep people from turning on a Super Bowl that was an exercise in offensive futility. It was the rotten contest the league deserved in light of the inexplicable no call by the officiating crew on a multi-penalty play that essentially changed the outcome of the NFC Championship. Always seeking out ways to make a bad situation worse, NFL Commissioner Roger Goodell finally emerged from hiding to deliver his much delayed non-response to the non-call that contained an outright lie concerning his claim that he had spoken with Saints players and could be encapsulated with two words: tough luck. Yeah, New Orleans got screwed – but nothing’s going to change, from the outcome of the right to play in the Super Bowl to the referees who watched the whole thing transpire and made a decision to, as Mike Detillier calls it, swallow the whistle. But beyond the emotional heartbreak of the Saints miss out playing in another Super Bowl as the sun speedily sets on the career of Drew Brees, the league literally took money out of thousands of people’s pockets with that game. A promotional company sales rep that the no-call cost them $40,000 easy in orders that would have kept their workers busy during a dead time. And New Orleans would have been almost as packed as Atlanta with football fans who wanted to be in the French Quarter to watch the Super Bowl and potentially celebrate a second Lombardi trophy. A friend who.now works in London was planning to cross the Atlantic on the British Airways direct to NOLA had the Saints made it. How many waiters, taxi drivers, hotel staff, and other service industry workers were robbed by the men in the black and white shirts? The word going around is that the city might receive a modicum of compensation through the awarding of another Super Bowl in the next decade. Naturally the NFL wouldn’t acknowledge that it’s a result of the failure of their personnel though that would be the conclusion everyone draws. Saints fans can take some solace that Rams cornerback Nickell Robey-Coleman won’t be getting a Super Bowl ring as he becomes an asterisk connected to a Super Bowl that itself is tainted by an asterisk. The controversy will haunt this Super Bowl, this league and the game in general in perpetuity. And it will haunt this commissioner. And I suspect the various parade krewes are busily working to put a canvas and papier mache exclamation point next to said asterisk. I’m sure we will be seeing a whole lot of Commissioner Goodell and referee Vinovich at the Mardi Gras.